Thank you they looked very peaceful on my front verandah. 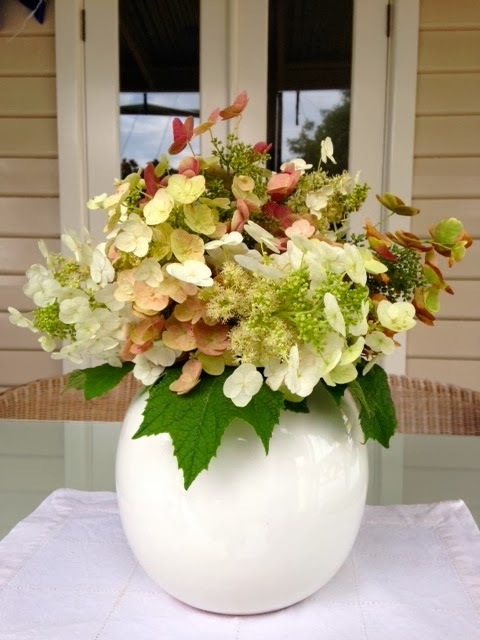 I love hydrangeas and what you have done with them, perfect vase for this as well. I made these into a posy and would have made quite a lovely bridal bouquet. These scream out Spring to me! Cut from the garden, the colours our lovely. Thank you. Thanks Sue, I look at this from the french doors out from my kitchen onto the front verandah, it lifts the soul oh such a little. Beautiful hydrangeas I love the creamy white. Your home looks so pretty too. I was just this minutes reading a little from 'The House with Seven Gables' by Nathaniel Hawthorne. I love the way her writes...he describes a garden so eloquently...there's something magical in the way a garden as you say 'lifts the soul.' Enjoy your beautiful garden. Thanks Debby, must get hold of that book it sounds good. You sound like you need something to lift your soul with all that blogging stuff going on. Thanks Hester - would love to visit this house and garden too.